Mercy is a recent Music graduate, who specialised in composition and music production while studying at the University of Ulster, Northern Ireland. 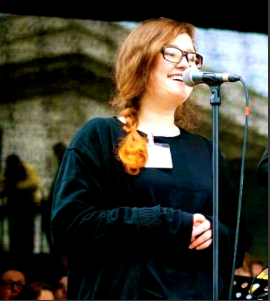 Despite being classically trained she has been versatile throughout her musical life working with and forming groups of various genres (gospel, folk, jazz), and leading workshops with a range of organisations (including Ex Cathedra and Youth Transformed). As a composer and songwriter she has had opportunities to score for film, create soundscapes for different projects as well as write and record songs with the band, ‘Grace and Mercy’ and for the charity, ‘LVE Haiti’. Since she has returned to Birmingham, Mercy has founded her own music project called J.A.M.M. (Jericho Aspiring Music Makers) Sessions, which will encourage Birmingham based youth to find their own musical voice and share it within the community.